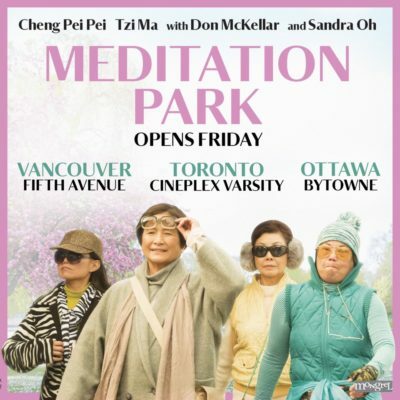 Empowering, warming and tender, Meditation Park follows the story of Maria (Pei-Pei Cheng) as she realizes that there is more to life than being a housewife as she ventures off to begin a new lifestyle on the heels of discovering her husband’s (Tzi Ma) affair. Director and writer, Mina Shum, beautifully captures the importance of friendship, forgiveness and a woman on a journey to find herself again. The scenic and romantic cinematography of the Vancouver area is striking, from the heart of Chinatown to the backdrop of the Second Narrows Bridge, it sheds light on communities not usually seen on screen. The film’s cast of supporting characters, such as Maria’s daughter, Ava (Sandra Oh) and Maria’s supportive group of friends who sell parking add humour and open Maria’s eyes to new and unrealised opportunities, reigniting Maria’s life even at an old age. Meditation Park is a feminist-driven film with strong themes of departure and escaping the norms of society. Pei-Pei Cheng’s Maria captivates you with her charm and heartwarming nature.